Generally speaking, the chimpanzee is a rain forest creature. However, this animal is also able to inhabit drier and less densely treed areas as long as they have access to forested areas when they take their shelter and search for food. Chimpanzees live in social communities of several dozen animals. They can habituate themselves to African rain forests, grasslands, and woodlands. They range from Senegal to Tanzania and are mostly found along the Zaire River. Chimpanzees normally walk on all fours, but they can also stand and walk upright. By swinging from one branch to another, they are able to move efficiently from one tree to another. This is also where they do their eating and sleeping. Basically, chimpanzees are native to the western and central part of Africa. In the wild, rainforests contain about 70% of all the life on earth. Chimpanzees can easily find all the food they need to feed their omnivorous diet. Since they are omnivore, they can also be found in swamplands. 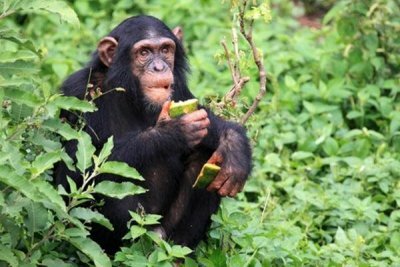 Chimps lives in groups of 16 to 100 and the large group is usually segregated into some cooperative family groups. Trees from the forest give protection from different predators. This is because chimps have great climbing abilities. Some groups are actually more nomadic compared to others. These groups move from one place to another in search of food. Nest building is seen in chimps which construct arboreal night nests by lacing branches together from one tree or more. This forms a very important part of their behavior. This is especially in mothers who teach their infants this trait. These nests consist of a mattress that is supported on a strong foundation and lined above with soft leaves and twigs. The nests are built in tress with a minimum diameter of about 15 feet and at a height of between 10 to 15 feet. The nests may be located in groups.